We had a similar problem when our children were younger. There is nothing supplied with the caravan to stop this. What we did was to go to Mothercare and buy a couple of bed guards which did the trick. 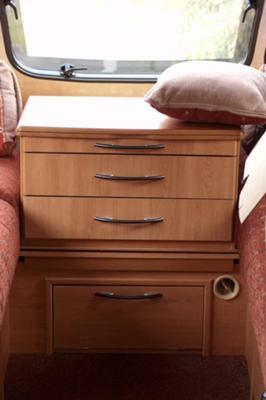 Ace Ambassador Drawer Storage When Bed is Made ? top section of 3 drawers and folding table. We've just begun our new life of caravanning and have bought a Ace Ambassador Jubilee 2 berth (2004 model). Really pleased with it but can't figure out what to do with the top half of the centre drawer/table unit that sits at front end of the cabin between the two sides of the sitting area. We've lifted it off but its about 2 inches higher than the base of the bed so doesn't go on the floor between the side sofas, so where does it stow when the bed is made up as a double ? You leave it where it is. Simply pull the bed slats out and arrange the cushions around the chest. Comments for Ace Ambassador Drawer Storage When Bed is Made ? We lift the top section off and put it on the unit opposite the sink, or out in the awning. That way you get a much bigger bed. Leaving it in place isn't the right answer. Its supposed to be a double bed I believe. The cushions that make up the centre section are the back rests from the seats, and are the same length as the seat bases (about 6ft-6ins), so if we fit them in the middle with the unit in place then they will hang over the bed end by some 15 inches or so. The drawer unit is designed to be lifted off so I'm guessing its supposed to go somewhere....but where ? We have a 2004 Abbey GTS Vogue 517 5 berth with L shaped seationg at the front and a double dinette at the rear with bunk over. The cushions in the rear dinette have a 'knee roll' along the front edge and a cut out section lengthways underneath - this is along the side that sits along the caravan wall - and is to allow for the bracket for the overhead bunk. We have found 3 sections of grey covered foam which are all attached together but are at a loss as to how to use them. They would fill the 'gap' of the cut out section but they are too long. The Handbook is no help at all - it just says to make us beds using cushions accordingly. Without anything to infill the cutout sections the bed is very uncomfortable and dips in the middle. We are totally at a loss with this problem. Can anyone help - we have tried moving the cushions into lots of different positions but can't seem to get this right at all. The 3 sections of grey covered foam are the mattress for the bunk bed. The cushions that make up the sofa section are for bottom bed. You should reverse the cushions when making the bed so that any knee rolls should face towards the floor giving you a flatter sleep surface.The seating cushions and the back rest cushions should be enough to make up the bottom bed mattress. I am just wondering what should be used to fill the gap created on the bottom bunk when the top bunk is up? There is a gap all the way along and there are no cushions that would fit to stop the cushions from moving around in the space created when the top bunk has been put up. Seems odd that caravan manufacturers think of everything these days and the cushions in the front double bed fit perfectly to make a solid mattress yet there doesn't seem to be anything provided to make the bottom bunk into a snug fit mattress. Anyone know what should be used? (I have a Compass Omega 524 year 2005). We have just purchased a Abi marauder 4 berth but the previous owner has removed the bunk. Can anyone give me information on where to find a replacement? If I can't find a replacement I would like to make a DIY bunk using the existing brackets. I would be grateful if someone could send me pictures of their bunk to help me figure out what to do. Your best bet would be to try contacting a Caravan Breakers Yard. Most offer a mail order service, so distance should not be a problem. A list of breakers can be found on our website. Do you have any advice for adding a bunk above a double in the back of a caravan? We have just bought an 80's Marauder and whilst our 3 kids will just fit on the double at the back we are hoping to be able to fit a bunk above. My husband is fairly handy with these kind of things, but wonderered if you had any advice? Are there any DIY caravan enthusiasts out there who could help on this? ABI Dawnstar 2 berth - Bed Making ? I have a very elderly abi dawnstar 2 berth. The folding table is not wide enough to fit the gap between the side sofa seating so how do you make a double bed out of it? It has beaten me although the seating is so structured that it looks like it should all fit together to make a double bed. All help gratefully received. Comments for ABI Dawnstar 2 berth - Bed Making ? We have the same problem with our ABI jubilee courier. It looks like it should have something to make it into a double bed but no sign of any pull out slats and the table is too narrow. Did you find an answer to the mystery? I have seen same system in new vans but mine has no pull outs and the table top is too narrow. A mystery indeed. If your Dawnstar has a set of drawers in the middle, which I presume it has, there is a part at the base which if you pull it out will reveal a set of wooden slats which makes your double bed as it rests on your two long seats. I am having problems with the front beds on a Bailey Pegasus 514 caravan. Can anyone help or does anyone have one of these caravans themselves who could help? We would suggest that you contact Bailey or your caravan dealer - if you purchased the caravan from them. When we had trouble or needed information or help with our Bailey Indiana we contacted the Bailey helpline and they were extremely efficient and helpful. Their e-mail address is helpline@bailey-caravans.co.uk. Hope this helps with your dilemma! Does anyone know where I can buy a replacement runner which the bed slats rest on when pulled out? Many thanks for any help you can give me with this. Why don't you try contacting a caravan breakers yard. Most offer a mail order service so travelling should not be a problem. A list of breakers can be found on our website. Our Bailey Pageant Monarch is great to have and the front seats make up into a superb double bed. However, as each front seat measures 6ft 2ins by 2ft 4ins we came to think how easy it would be if we simply used them as single beds. No matter if we turn the seats over or leave them as they are, we cannot overcome the knee rolls causing discomfort or rolling off the bed! What a pity Bailey, or any other maker, simply do not produce flat seats. We are considering buying a mattress topper and cutting it to level out the seats. Has anyone got a better idea and what do other users think of the benefits of knee rolls? Bailey assures me this is what customers want even though household furniture rarely sports them. If anyone has any ideas, please let us know and we will post your replies on our website. Hello does any one know where to buy or aquire a side dinning area bunk bed and fittings. Your best bet would probably be through a caravan breakers yard. We have a list of breakers on our website or you could search the internet to find one local to you.